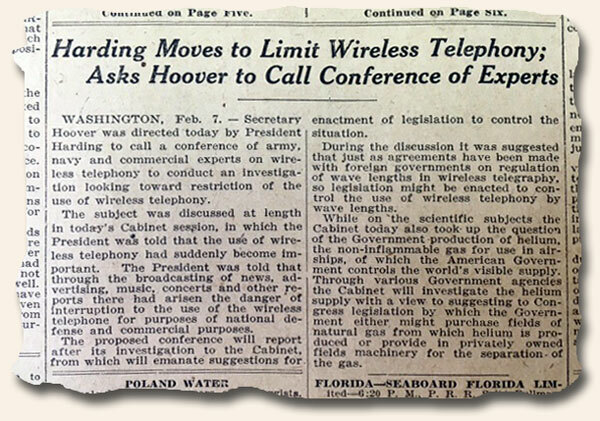 As far back as 1922 the international community, including the U.S., appreciated the potential benefits of wireless communication, but also understood it was fraught with problems. At the time their greatest concern was interruption of service due to interference from other devices. Of course we now know this “issue” was just the tip of a very dangerous (invasion of privacy) iceberg. How ironic the very institutions which were decrying the inherent drawbacks are now likely those who are exploiting them – at the expense of its citizens. Still, this early article found in the February 8, 1922 issue of the NY Times makes for interesting reading. May I ask you as a specialist, what are the most important publications or some wider literature on the circulation of news in the 18th-century Europe? I’m looking for all the works that would specifically inquire into how fast the information travelled. Thank you in advance. Hello Adrian: We have been asked this question in the past, and if there is a definitive study has been done, we are not aware of it. If you ever find anything that helps to answer this question, please post. Many would like to know.